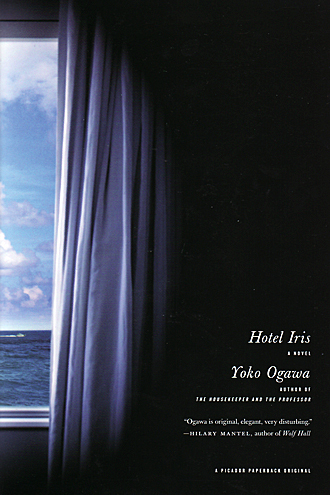 Hotel Iris is the third work by Ogawa Yōko to appear in print in America, following The Housekeeper and the Professor and The Diving Pool. Having read several of her works now, I think I am starting to get a feel for her style of writing, which is beautifully conveyed by translator Stephen Snyder. Ogawa takes the everyday and imbues it with a sense of strangeness. Nothing overtly fantastic happens in her stories, but everything is always a little unsettling. Something is always a little bit off. There is always a sinister current running underneath the mundane. In Ogawa’s novels, the petty cruelty of human beings is on full display, but it is up to the reader to uncover the mystery of a deeper cruelty. The questions that aren’t answered are more upsetting than the questions that are. In Hotel Iris, a seventeen-year-old young woman named Mari has been forced to drop out of high school by her mother, who needs her to work at the family’s seaside hotel. Since Mari’s father has died, Mari’s mother has taken on a kleptomaniac housekeeper, who not-so-secretly steals from Mari. When, one night, a prostitute flees from one of the rooms in the hotel, Mari finds herself attracted to the older man from whom the woman flees. This older man, who lives by himself on an offshore island, is a translator of Russian. He falls in love with Mari, who craves the sexual masochism he displays when the two are alone. The specter of the man’s dead wife, whom he is rumored to have killed, haunts their relationship, which is further strained when the translator’s tongueless, college-age nephew stays over for a few days. These relationships develop over the course of this short novel, which is narrated by Mari, who hints at her desires, frustrations, and rich inner world through anecdotes and observations instead of through direct statements. The novel unflinching depicts all manner of sexual acts, but its eroticism and sensory imagery are focused not on the meeting of bodies but rather on the depictions of small, everyday things, like a stain on a scarf, the music of an amateur, or the dripping of pizza grease. The narrative tension created by the almost constant yet varied reiteration of certain themes, like the fear of something hidden being uncovered or the uncertainty of how far violence can go, prevents the reader from ever settling into complacency concerning Mari’s life and her relationships. In the end, I think, this is a novel about growing up, and all the psychological baggage that goes along with the process. Ogawa warps many psychological tropes (like the Oedipus complex) through her protagonist, however, and Mari’s loss of innocence is neither celebratory nor unproblematic. In many ways, Hotel Iris is something of an antidote to feel-good chick lit novels like Yoshimoto Banana’s Goodbye Tsugumi. It’s dark and it’s disturbing. Its themes and imagery are understated; and, although it has quite a great deal of forward momentum, it is never driven by its plot, much of which is left vague. In my opinion, this is a perfectly constructed and beautifully written novel. Please buy this. Please read it. Please tell all your friends about it. Ogawa has numerous novels translated into various European languages, and we really need more of her work translated into English. I’ve not read The Housekeeper and the Professor yet, i’ve read The Diving Pool, so i’m really looking forward to reading this book, which judging by your review sounds a bit darker territory than The Housekeeper. Yes, I feel the same way working through Ogawa’s work. There is a depth for readers who are willing to ponder the ideas explored in these relatively short novels. Isn’t it interesting how repulsive the other characters are who are supposedly “normal” compared with the very odd Translator. It raises fascinating questions about the nature of relationships. Looking forward to “Revenge” next! Sorry to multiple post on your blog (I swear I am not a stalker)! I just want to mention to Adam that if you haven’t read Revenge yet, do not wait any longer! It truly is a work to be studied, IMHO. It was one of those books that once I finished I went right back to page one and reread. Weeks later, it is still with me. Ah, thanks! Perhaps it will have to move forward in my queue of books to devour!